We went to Disney World two years ago while in the area for General Assembly. Disney is built on expectations of something different, out of the ordinary, and they strive to make this true in the big things and the little ones. They have around a gazillion employees, including many attendants for the rides. They greet guests, help them into their seats as needed, and triple-check the safety features. At the start of many rides, these friendly folks cheerfully sent us off with "Have a wild adventure!" It was clearly a standard Disney phrase for their fantasy world, but it got me thinking. How much am I willing to risk for great possibility? And is triple-checking for safety enough for me, or am I obsessively concerned with eliminating any possibility of failure or hurt even beyond that? I wanted a souvenir of the trip, and was drawn to Eeyore. The one I loved wasn't just the usual Eeyore; it was Adventure Eeyore. He was wonderfully soft and had great eyes, and was outfitted for a safari. I loved the image of this good-hearted donkey that doesn't really have a lot of hope that things will turn out, but he's geared up and ready to go anyway. We spent a couple of days there -- enjoying friends, going on rides, watching the fireworks and parades and just generally taking in the Disney experience. Through it all, I kept thinking of Eeyore. I saw a little of myself in this fictional character. And he's lovable and true, but Eeyore is not all that I am, nor all that I want to be. Of course, being Disney, Eeyore was not the only option. A more obvious choice of for an adventure-ready character was Tigger, the energetic and brightly-colored critter who's likely to start bouncing off toward whatever captures his attention. There was also an Adventure Pooh, the sweet bear that worries some, but usually figures that things will turn out okay, and is usually right about that. More than any of them, I loved all of them. I loved them together -- three friends, very different from each other in perspective and personality, encountering the same situations in different ways, and joining together to do it. I could see some of Eeyore in me, and some of Tigger, and some of Pooh. I could see all of them, too, in the best groups I've been part of. The three of them together are a great team, creating a fabulous and wise mix of optimism, caution, and hope. 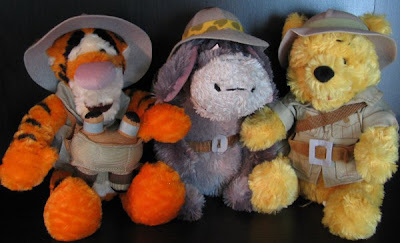 And that is how Adventure Eeyore, Adventure Tigger, and Adventure Pooh came to have their home -- together -- on the bookshelf behind my desk.